Ever since the first Borderlands came out the series has been one hell of an enjoyable experience. What’s not to love about great co-op game play, a bazillion different guns to use, interesting and fantastic stories and a dose of good ol’ fashion fun to boot. It's been announced that those wonderful folks over at 2K Games are going to be releasing Borderlands: The Handsome Collection for the Xbox One and Playstation 4 on March 24. Not only will us next-gen players get the chance to play the Borderlands Pre-Sequel game that was a last-gen exclusive, but we'll also get Borderlands 2 in all its revamped glory as well. On top of that all of the DLC that has come out for both games before the release date of March 24th will be included. Throw in the expected improved graphics and four-way split-screen cooperative action for good measure. Oh did I forget to mention all this is yours for the price of $59.99? That's one hell of a steal; much like the Halo: The Master Chief Collection was packed full of four games for that same price now we have two Borderlands games and fifty DLC packs ranging from new missions, characters and skins...basically a smorgasbord of content. Plus, if you previously played either of these games on Xbox 360 or Playstation 3 you can transfer your characters and save games over to the new versions. The option lets you start fresh if you want on these games, but also gives you the option of continuing your previous game in fresh new HD graphics. 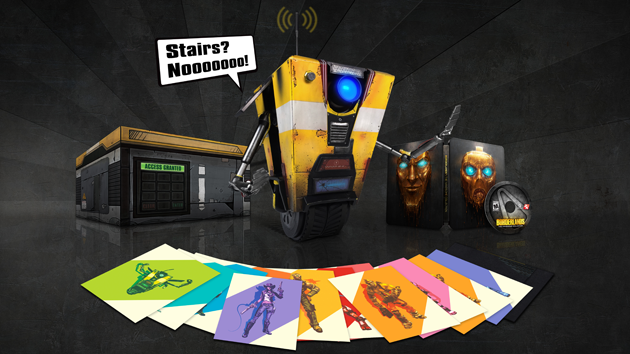 Not only is both games being re-released, but fans will get the chance to get their hands on a pretty magical collection: Borderlands: The Handsome Collection Claptrap-in-a-Box Edition. This edition will set you back $399, but you get your own Claptrap! Said Claptrap comes equipped with a camera and can be controlled from an Android/iOS device. It's a very limited special edition, being offered to only 5,000 potential suitors. If that's not enough to get you to shell out $399 for a special edition remastering of old games, I don't know what is. Over the past year, there seems to be a growing trend of releasing collections of games from the previous generation of consoles in remastered bundles to entice the gamers to retread old stomping grounds. When done right it’s a win-win for both parties, as they make a little money off of rereleasing these solid games and us gamers get a chance to relive past experiences on our brand new next-gen consoles. Borderlands: The Handsome Collection completely came out of nowhere to rock the gaming world. If there are more stealth launches like this coming over the course of the year you can guarantee that your wallet is going to get hit a lot harder than you might have thought. Keep an eye out for this one in March and if you have a little extra scratch don't be shy about Borderlands: The Handsome Collection Claptrap-in-a-Box Edition that comes with a remote control Claptrap. Otherwise, you're parting with $60.